Big Blue was created by a collaboration of the EBHQ Silk Club. 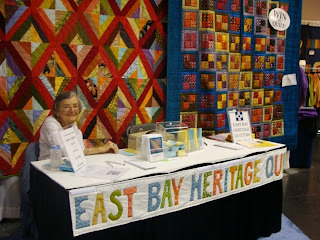 The quilt is made from silk tie fabrics that were donated to EBHQ by the East Bay Depot for Creative Reuse. The project brought together quilters who wanted to learn basic silk crafting techniques, and as a result, it provided the opportunity to build community and outreach to new members. The project was developed and coordinated by Sue Fox and Kathy Vaughn. The quilting was done by Sue Fox. 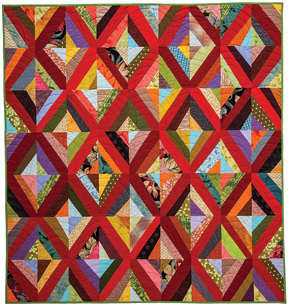 This beautiful quilt by Rebecca Rohrkaste demonstrates her artistic sense of color, visual texture, and graphic impact. The quilt was inspired by a string quilt by Irene Bankhead, an African American quilt artist from Oakland. It was pictured in a calendar of quilts from Eli Leon's collection which has hung in Rebecca's studio for years. 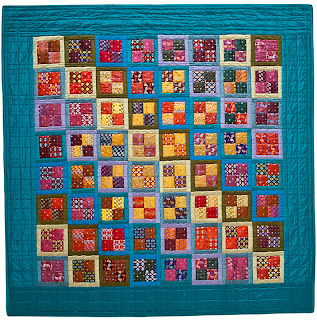 Rebecca's quilt is the third she has made in this format, using rectangular blocks and red center bars. The quilting was done by Angie Woolman.